Tis the season to discuss all things e-commerce and one of the most underutilized optimization opportunities that can potentially add some serious ROI to your bottom line – the shopping cart. Shopping cart optimization is considered a highly strategic tactic as presenters Austin McCraw, Senior Editorial Analyst, MECLABS, and Jon Powell, Senior Manager of Research & Strategy, MECLABS, explained in one of our recent Web clinics on shopping cart optimization. So to help you tweek your shopping carts, today’s MarketingExperiments blog post will share the six last-minute changes you can make to your shopping carts that Austin and Jon presented in the Web clinic “Optimizing Shopping Carts for the Holidays,” which you can use to aid your shopping cart optimization efforts. Effective tests are not simply designed to achieve a valid result, but a valuable result. The goal of a test is to get a learning, but some “learnings” are more strategic than others. Marketers must be able to identify where in the funnel is the greatest opportunity for optimization. Also, to help in getting this information to you faster, we’ve split up all the changes and direct linked to specific times in the hour-long Web clinic video replay when those topics are discussed. Looking for opportunities to simplify your checkout process is a great starting point for cart optimization. This section of the clinic also features an experiment that shows how one fitness company increased its conversion 29% by removing unnecessary steps. Another last minute change you can test is reducing multiple calls-to-action to just a single call-to-action. This will help cut out unsupervised thinking and guide your customers to the next step in your checkout process. To help make this change actionable, this section of the clinic includes additional changes based on customer orientation that you can add to your testing queue. The idea here is that just because a customer is ready to purchase, it does not mean you have finished your value proposition work — most likely it’s only getting started. Placing value throughout your checkout process can significantly impact your ROI. The featured experiment demonstrates this in how a monthly wine and cheese club increased subscription conversion 17% by integrating value proposition into its checkout process. When you ask for information from your customers, you should also explain to them why you need it. The information you’re asking for may be necessary to complete the sale and valuable for your future campaigns, but I promise your customers don’t see it that way. They perceive everything you ask for as a cost to them, and when you ask without justifying why, you run the risk of losing those customers. 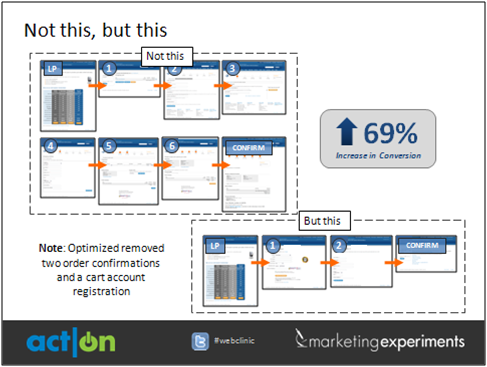 The slide above is a side-by-side example from an experiment in the clinic that touches further on this change by sharing how an online college textbook seller was able to increase conversion 19% by justifying each step the customer was asked to take in its process. According to Austin, this is perhaps the easiest change you can make, but you must first discover what anxieties your cart may present to customers. The final experiment Jon shares in the clinic shows how addressing anxiety specifically can have a heavy impact on the bottom line, as one wholesale collector item retailer was able to increase annual revenue by $500,000. Promise vs. Intrigue: What is the most effective way to word a subject line? First of all thanks for the post, and its true unnecessary steps irritates, and misleading product description fake reviews are also harmful, I know a E commerce site who paid users for reviews , which means all reviews are fake and a users who want to purchase a product cant judge from reviews. Thanks for sharing informative guide. Fake products reviews are always dangerous because the users that wish to buy them will not really judge the products through reviews on that specific products.